I saw the picture above on a friend’s Facebook page and it really appealed to me. I grew up in a very small rural community of farmers in South Africa and did not travel abroad until after I was married and we had children. Unknown to me I was forming mental pictures of national stereotypes that encouraged prejudice. Since then I have lived in England for many years, spent a year in France, months in Italy and visited about 20 countries for prolonged periods. 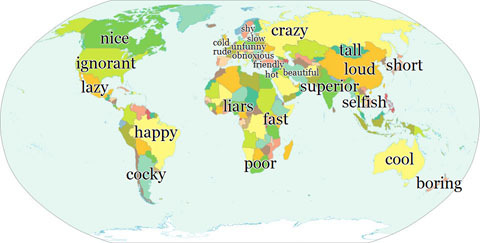 The result is that I now have a far better understanding of people from different cultures and I have friends all over the world. In my opinion the best way to get to know people from other cultures is to spend some time living with them. A vacation staying in a hotel catering for tourists is great but no substitute for living with the locals. But, I hear you object, it costs so much I can’t afford to travel all over the world. Neither can I but that has not stopped me and hopefully my travelling days are far from over. There are still so many places I want to visit, so many people I want to meet and even places I want to re-visit. The only way I have been able to afford it is by House Sitting. That means my only expense is getting there and my food. My accommodation is free of charge. What a blessing. It also means I stay in lovely homes rather than a hotel room, I meet real local people, I can visit the home owners local church if I wish and be assured of a good welcome and I have a wonderful time and make new friends. 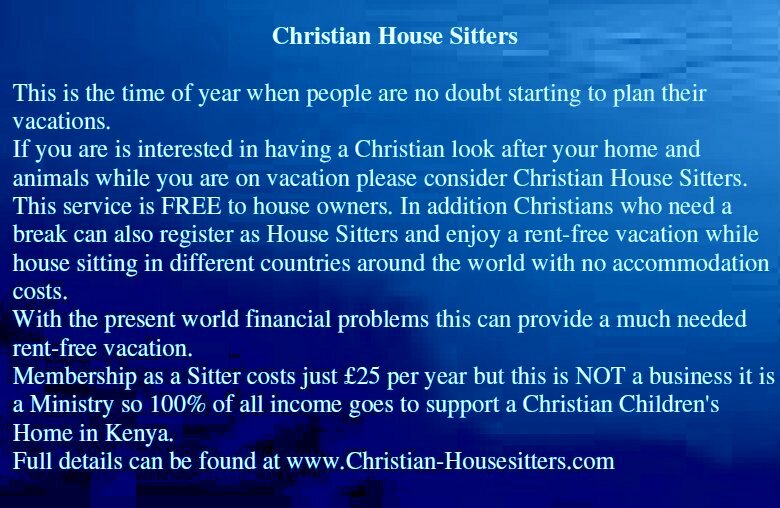 Christian House Sitters can help you enjoy rent free vacations all over the world. We can also help you find reliable people who will look after your home and pets free of charge while you are away. Posted in Christian, Christianity, Church, Holiday, House Sitting, pets, Save Money, Travel, Vacation and tagged Christian, england, Facebook, France, holiday, Hotel, House sitting, Italy, rent free, south africa, Travel, Travel and Tourism, Vacation. Bookmark the permalink. God has blessed me and allowed me to visit many countries over the years but I still get excited at the prospect of going somewhere different. As I was thinking about places I would like to visit I decided to do a little research and see how my list compares with the ‘official’ lists. According to http://bit.ly/XiLuzx Travel + Leisure magazine invited Australians to vote on their dream lists of top spots throughout the world. If the only thing stopping you is the cost we can most likely help by cutting out the cost of your accommodation while you are away and also arranging for someone to look after your home and pets free of charge. Sounds to good to be true? Read on and judge for yourself. 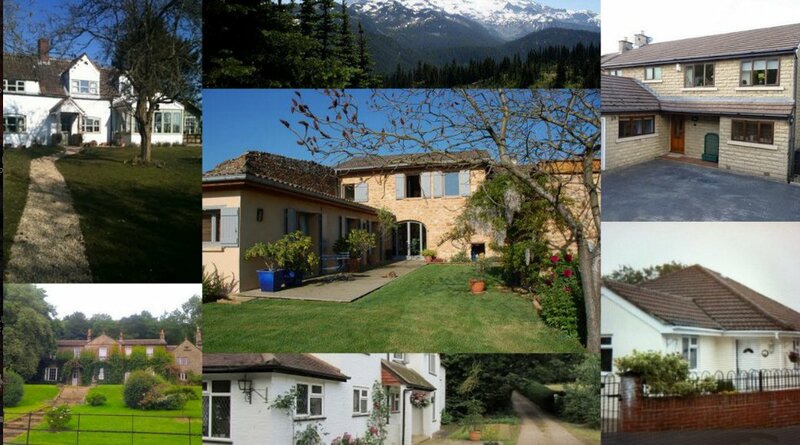 This is a collage of a few of the recent rent-free properties we have been able to offer. 3. You could naturally register as both an owner and a sitter. WordPress are adding adverts to blogs. Seems they are not always shown but if there are adverts on this page please note they were not placed by me, not approved by me and do not imply my recommendation. Posted in Christian, Holiday, House Sitting, pets, Save Money, Travel, Vacation and tagged Australia, Canada, Christian, Christian House Sitters, France, Greece, House sitting, Italy, new zealand, Pet sitting, Pets, U.K., United States, Vacation. Bookmark the permalink. Celebrating Christmas around the world. Marilyn and I have been blessed and have travelled to a lot of different countries. It has been fascinating to see how things that we take for granted in our own country can appear so odd and are experienced so differently by our neighbours around the world. Because of Christian House Sitters we have been able to enjoy Christmas in France (twice), Italy and the USA. In addition I grew up in South Africa and we now live in England. Many South Africans have a Christmas dinner in the open-air at mid-day, it is usually a traditional dinner of either turkey, vegetables, and plum pudding, crackers and paper hats. Often followed by a dip in the swimming pool. When we moved to England there was hardly any difference except that it was mid-winter not summer so no need for fake snow and certainly no afternoon swim. The cake, among other food in great abundance is served at the grand feast of the season, which is called le reveillon which is a very late supper held after midnight mass on Christmas Eve. The menu for the meal apparently varies according to regional culinary tradition. In Alsace, goose is the main course while the Parisians feast upon oysters. Our Christmas in Italy was far from typical as we were staying high in the mountains and for 10 days could not leave the house because of a severe snow storm. So I read up on their Christmas traditions and discovered that On christmas Eve the dinner is called cenone which is a traditional dish of eel. Christmas lunch is Tortellini in Brodo which is filled pasta parcels in broth, also served is cappone which is boiled capon, or roasts are served in central Italy. Apparently in Italy the children wait until Epiphany, January 6, for their presents. According to tradition, the presents are delivered by a kind ugly witch called Befana on a broomstick. It was said that she was told by the three kings that the baby Jesus was born, she was busy and delayed visiting the baby. She missed the Star lost her way and has been flying around ever since, leaving presents at every house with children in case he is there. She slides down chimneys, and fills stockings and shoes with good things for good children and it is said leaves coal for children who are not so good. Our American Christmas was fabulous with the traditional Christmas dinner of roast turkey with vegetables and sauces. For dessert it is rich, fruity Christmas pudding with brandy sauce. Mince pies, pastry cases filled with a mixture of chopped dried fruit. Not unlike what we have back in England. How do you celebrate your Christmas? I am really interested to hear from people all over the world. As you know we run Christian House Sitters for 2 reasons. Firstly it provides Christians all over the world with the opportunity to travel and experience other cultures. Staying in lovely homes rent-free. That is why we have been able to experience so many different international Christmases. Christian House Sitters also finds you someone reliable and responsible to look after your own home and pets while you are away. This is a free service. God bless you and may your Christmas be filled with His love, peace and joy. P.S. WordPress are adding adverts to blogs. Seems they are not always shown but if there are adverts on this page please note they were not placed by me, not approved by me and do not imply my recommendation. Posted in Bible, Children, Christian, Christianity, Christmas, Holiday, House Sitting, Orphans, Travel, Vacation and tagged Christian, Christian House Sitters, Christmas, France, holiday, House sitting, Italy, Kenya, rent free, south africa, Travel, United States, Vacation rental. Bookmark the permalink.